The National Beef Recording and Improvement Scheme of the Agricultural Research Council, established almost 60 years ago, has played a central role in the improvement of the genetic potential of the national herd through the application of recording services and associated technologies. The overarching objective of the scheme is to enhance the sustainability and profitability of beef production, ultimately contributing to food security, job creation and human capital development. Investing in the activities of the Scheme has since its inception shown to yield significant positive returns, benefitting the entire South African beef production industry as a whole. It has enabled producers to “produce more from less”, in particular under resource-limiting conditions. The primary aim of the National Beef Performers Awards of the ARC is to acknowledge farmers that have excelled in line with our vision. It has become a showcase and a platform for our countries’ top achievers when it comes to breeding genetically superior animals using performance recording as a tool. It is with gratitude and admiration that we reflect on our country’s top performers at our annual awards ceremony, one that has become a highlight on our country’s agricultural calendar. This year marked the 40th anniversary of the Scheme ensuring that top-performing producers, across the spectrum of industry sectors, are recognised and given a platform to display their achievements. The Awards are widely supported amongst key role players of industry including government and Farmers’ Weekly and as such have become one of the highlights on our country’s agricultural calendar. Bulls that have completed the standardised growth test (Phase C) of the ARC’s National Beef Recording and Improvement Scheme during 2017 and that received either a Gold or a Silver Merit certificate feature in this award category. A new development in this category involves the inclusion of Residual Feed Intake (RFI) data (where available) as a criteria of evaluation. 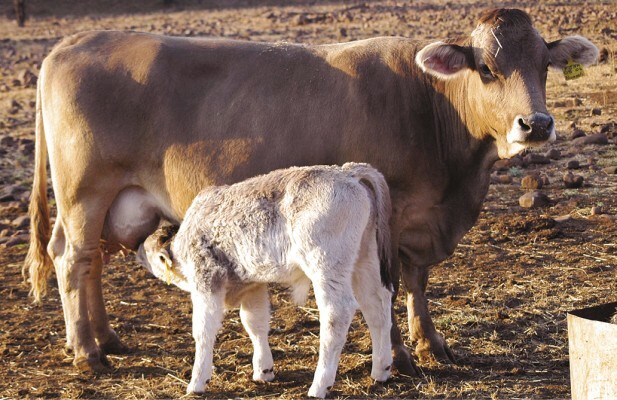 Cows are evaluated based only on performance data and have to exhibit outstanding reproduction figures whilst having excelled in other economically important traits that include maternal ability and pre-weaning growth rate (weaning weight). Cows from all breeds are eligible to participate in this category, which will be contested for the 40th time this year. For a bull to be eligible to contest in this category it must be bred from an elite cow whilst displaying exceptional performance figures at the same time. Indeed this is a very tall order in breeding terms and it is thus not surprising that this category is also known as the “the best from the best” category. This award marks its 16th anniversary since inception in 2003. The category recognises members of the Kaonafatso ya Dikgomo Scheme whose herd management practices as well as herd performance improved significantly over the past year. The Scheme’s development approach assists emerging cattle farmers to apply beef recording and improvement technology to facilitate accurate selection for economically important traits and increase productivity and profitability of their herds. To date more than 8 000 are registered on the INTERGIS national database, which has already uploaded data for more than 86 000 animals. This award category is probably one of the most prestigious in the South African beef industry and acknowledges breeders and producers for exceptional achievements when it comes to performance testing, genetic improvement, breeding and management. It also highlights the impact and advancements that performance testing can facilitate, as the finalists’ performance credentials demonstrate. Participants are also evaluated in terms of their leadership skills, involvement with, and acknowledgement by the formal structures of industry. Breeders who are prominent stud breeders themselves and who have a track record of how they plough back their wealth of knowledge and experience in industry are eligible to participate. This award aims to recognise a commercial beef producer who actively participates in performance testing and who has made great progress in his/her own enterprise through the application of available performance recording technologies. The award recognises the province with the highest number of participants in the scheme. These farmers must be registered on INTERGIS and must have loaded data on the database between March of the year preceding the award and April of the year of the award. The Agricultural Research Council is a premier science institution with a national footprint that conducts research with partners, develops human capital and fosters innovation in support of the agricultural sector. The ARC provides diagnostic, laboratory, analytical, agricultural engineering services, post-harvest technology development, agrochemical evaluation, consultation and advisory services, food processing technology services as well as various surveys and training interventions. For more information, visit the ARC website at www.arc.agric.za or call (012) 427 9770 or download the ARC Hub App at archub.agric.za, also available on Android and IOS.